Happy Chrismahanukwanzika Everybody! Here's a RPG Present for You! I'm pretty stoked to be able to announce "my" Christmas present to you loyal 12 readers (and anyone else who happens by). Somehow I managed to get involved with the creation...well more editing and creative input after-the-fact (if you ask me) of Matt Jackson's Lunch Box Heroes. This all started out, at least on my side of things, as looking for a rules-light game I could play with minimal fuss. I'd come close a couple of times, but each step lead me a bit closer to finding exactly what I was looking for. I'm thankful for Matt letting me get involved and even more so for being able to give this joint-gift from us to you. I know that usually those "it's from both of us" Christmas gifts can be a bit lame (unless the givers are married or some such, then it's not weird), but hopefully you'll enjoy this anyway. Since it is a gift it is free...not as in Pay-What-You-Want, but free...free. Enjoy. 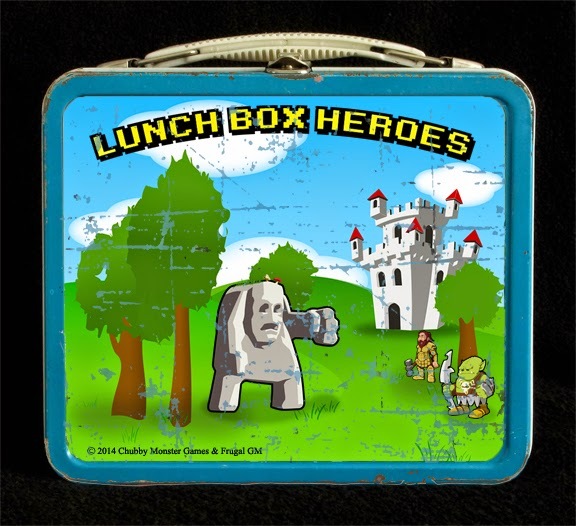 Lunch Box Heroes on DriveThruRPG. You might want to check out the rest of the Frugal GM "line" of stuff, or Matt's efforts with Chubby Monster Games.